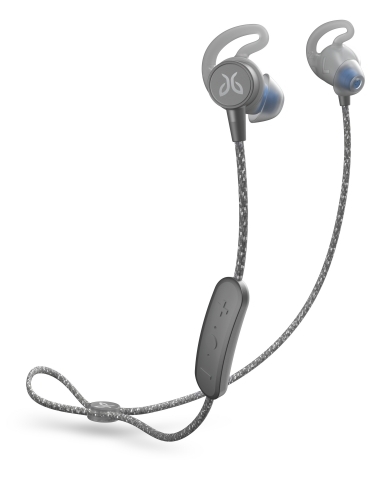 PARK CITY, Utah--(BUSINESS WIRE)-- Jaybird, the leader in sport headphones for runners, announced today Jaybird Tarah Pro Wireless Sport Headphones - industry leading 14 hours of battery life, extremely durable, adventure-proof compact wireless headphones. Equipped with unique features geared towards athletes, they provide a secure custom-fit and uncompromising sound, with new Personalized EQ functionality through the Jaybird app. Tarah Pro is the first in Jaybird’s Pro Series: a new line of pinnacle-level wireless sport headphones for endurance athletes. "Designed with insights from some of the world's best endurance athletes, we are extremely excited to announce Tarah Pro, the first wireless headphone in Jaybird's Pro Series," said Jamie Parker, CEO of Jaybird. "We've set the bar in the category with 14 hours of battery life, but I must say that I'm equally excited about the never-before-seen features bringing new benefits for runners and fitness enthusiasts, including Switch Fit for a quick transition between over- and under-ear fit, the non-stick sport cord introducing reflectivity and the new Personalized EQ in the Jaybird app." Tarah Pro delivers an industry-leading battery life of 14 hours to accompany athletes on some of their longest runs. A quick five minute charge gives you two full hours of play time so there's no excuse to get out and run with your favorite tunes. And, the new Magnetic Snap Lock feature automatically pauses your music when the earbuds are snapped together, securing them around your neck. The music automatically restarts where you left off when you put the buds back in your ear, preserving battery life. Featuring a lightweight design, Tarah Pro is waterproof (IPX7) and sweatproof, meaning they can handle any inclement weather you encounter: rain, snow, or even accidental submersion down to one meter for up to 30 minutes. Jaybird rigorously tested Jaybird Tarah Pro in all sweat conditions and used double hydrophobic nano coating on the buds so you can train as hard as you want. Everything about Tarah Pro was designed to ensure maximum water- and sweat-proofing, including the use of the USB-compatible proprietary charger. Since everyone trains differently, Jaybird's Switch Fit allows runners and athletes to easily rotate between over-ear fit for a secure, sports-specific usage and under-ear for more relaxed situations on the fly, while the buds remain in-ear. The non-stick reflective fabric cord helps with visibility, allowing you to train when it’s dark out with extra visibility. And, with the new Speed Cinch cord management system, it’s super easy to adjust the length of the cable quickly. Tarah Pro comes with three different sizes of our combined silicone ear tips/fins for a customized comfortable, secure fit. The latest version of the Jaybird app allows users to unlock totally new functionality with Tarah Pro. Now Jaybird is making it even easier for people to get the perfect personalized sound. As part of the simple set up process, the Jaybird app will run users through a quick hearing test in order to create a personalized EQ setting based on Jaybird's proprietary algorithms. The test will help you set your ideal sound profile, meaning a unique, personalized music experience with uncompromised sound quality. This is all in addition to Jaybird’s standard EQ and Spotify® integration which allows you to create and share playlists within the app. Jaybird Tarah ProWireless Sport Headphones are expected to be available for order exclusively at jaybirdsport.com today and in select stores in November 2018 for a suggested retail price of $159.99. The wireless headphones will be available in three color combinations: Black/Flash, Mineral Blue/Jade. The third color, Titanium/Glacier, is available exclusively at jaybirdsport.com and Best Buy. For more information, please visit jaybirdsport.com. The Jaybird app is free and available through the iOS® and Android™ app stores. Use of the app's Spotify® functionality requires a Spotify® Premium account. Established in 2006, Jaybird is a pioneer in sports Bluetooth® wireless headphones for runners, outdoor athletes, and fitness enthusiasts - designed for athletes, built for adventure. Developed in close collaboration with our team of professional athletes, Jaybird earbuds feature secure comfort-fit and incredible, customizable sound in an adventure-proof, compact form factor. Jaybird has established itself as the brand for active people who love to power their passion with their favorite audio content, from music to podcasts, all without wires. For more information, please visit www.jaybirdsport.com or #PowerYourPassion with us on Instagram, Facebook and Twitter. Jaybird is a brand of Logitech International, founded in 1981 and headquartered in Lausanne, Switzerland. Logitech is listed on the SIX Swiss Exchange (LOGN) and on the Nasdaq Global Select Market (LOGI). Jaybird, the Jaybird logo, and other marks are registered in Switzerland and other countries. All other trademarks are the property of their respective owners. For more information about Jaybird and its products, visit the company’s website at http://www.jaybirdsport.com.